Nearly 200 countries at the UN climate talks have agreed universal, transparent rules on how nations can cut greenhouse gas emissions and curb global warming, putting the principles of the 2015 Paris climate accord into action. But to the frustration of environmentalists and a group of countries urging more ambitious climate goals, negotiators delayed decisions on two other climate issues until next year in an effort to get a deal. The talks in Poland took place against a backdrop of growing concern among scientists that global warming on Earth is happening faster than governments are responding. Last month, a study found global warming will worsen disasters such as the deadly California wildfires and the powerful hurricanes that have hit the United States this year. A recent report by the Intergovernmental Panel on Climate Change (IPCC) concluded that while it’s possible to cap global warming at 1.5C by the end of the century compared to pre-industrial times, this would require a dramatic overhaul of the global economy, including a shift away from fossil fuels. 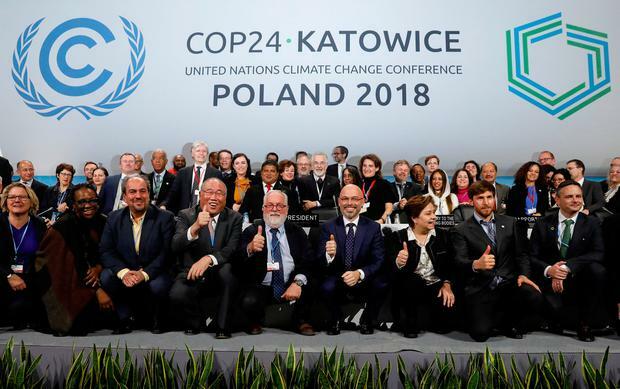 Alarmed by efforts to include this in the final text of the meeting, the oil-exporting nations of the US, Russia, Saudi Arabia and Kuwait blocked an endorsement of the IPCC report mid-way through this month’s talks in the Polish city of Katowice. That prompted uproar from vulnerable countries like small island nations and environmental groups. Among those that pushed back hardest was the US, despite President Donald Trump’s decision to pull out of the Paris climate accord and his promotion of coal. “Overall, the US role here has been somewhat schizophrenic – pushing coal and dissing science on the one hand, but also working hard in the room for strong transparency rules,” said Elliot Diringer of the Centre for Climate and Energy Solutions, a Washington think tank.